By 1967, the Beatles were used to media scrutiny and controversy. 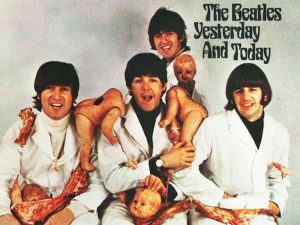 Sometimes the media thrust it upon them; sometimes the Beatles put themselves out front. John’s 1965 comment comparing the Beatles’ popularity to that of Christ resulted in some radio stations banning their music and some record stores refusing to sell their records. The original 1966 album cover for “Yesterday and Today” with them sitting in bloody butcher smocks holding pieces of meat and broken baby dolls was so controversial that Capital Records immediately withdrew the album, re-covered it, and only then re-released it. In 1967, most people and their govenments continued to view marijuana as a gateway drug, addictive, and deadly. While research had already suggested that none of those views were accurate, society continued to legislate against its use, sale, and production. Those familiar with the substance saw it in a different light. John “Hoppy” Hopkins was a British photographer, journalist, researcher and political activist. He used marijuana and a jury found him guilty of its possession and use. The judge sentenced Hopkins to 9 months in prison. Stephen Irwin Abrams was an American drug policy activist living in the United Kingdom. He led the “Free Hoppy” movement and wrote a full page advertisement that demanded cannabis law reform. Among the dozens of researchers, academics, scientists, and other well-known people, Abrams sought out the Beatles imprimatur. 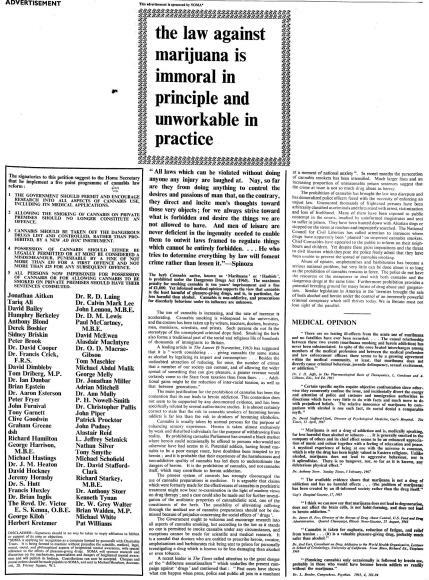 They not only granted the use of their names to the petition, Paul paid for the advertisement in The Times. Paul did not want it known he had done so, but having such an illustrious person sponsoring such a controversial piece in a major paper meant the secret was poorly kept. It went on to speak to the view of marijuana’s danger and dispute those views. 64 signatures appeared. After each of the Beatles’ names, the initials M.B.O. appeared: Member of the Most Excellent Order of the British Empire. Queen Elizabeth had honored them with the award on October 26, 1965. Click on the following to view the entire text, from the excellent Beatles Bible site. Likely, many of the same people who had criticized the Queen’s honoring John with the award because they felt him unworthy, again criticized Lennon for returning it. Gosh darn it. The Beatles: damned when they do. Damned when they don’t.